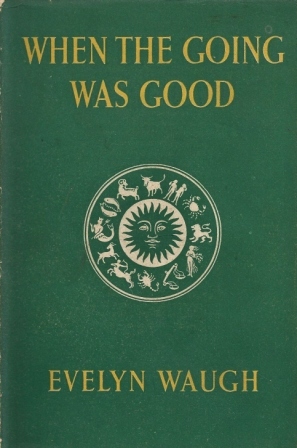 When the Going was Good by Evelyn Waugh ~ 1946. This edition: The Reprint Society, London, 1948. Hardcover. 314 pages. My rating: 7.5/10. Held my interest throughout. I’m not even sure where I picked this one up – it appeared in a stack of books gathered in this summer’s travels through B.C. I’m thinking either Kamloops or Vernon, though there is no price and bookseller code marked anywhere on the flyleaf. Possibly from the Sally Ann or a similar charity shop? No matter what it’s provenance, I’m most glad I’ve added it to my private collection. A most enjoyable read, consumed in goodly portions each evening for the last week just before closing my eyes. It’s vintage Waugh, and it’s well-written, the author’s disclaimers aside. Some of it is excellent; it’s all very readable, and it made me brush up on my history; Waugh was of course writing for a contemporary audience, and though I was pleased to realize his references were easy to place, I was quite vague on the details. Chapter One: A Pleasure Cruise in 1929 (From Labels) – London, Paris, Monte Carlo, Naples, Catania, Haifa, Cana (Galilee), Port Said, Cairo, Malta, Crete, Constantinople, Athens, Corfu, Gibraltar, Seville. Chapter Two: A Coronation in 1930 (From Remote Peoples) – The coronation of Ethiopian Emperor Ras Tafari at Addis Ababa. Chapter Three: Globe-Trotting in 1930-1 (From Remote Peoples) – Zanzibar, the Congo, Aden, Kenya (Nairobi, the Rift Valley), Tanganyika, Cape Town. Chapter Four: A Journey to Brazil in 1932 (From Ninety-two Days) – Guiana and Brazil. Chapter Five: A War in 1935 (From Waugh in Abyssinia) – The Italian invasion of Abyssinia, from a war correspondent’s perspective. Farce versus bloodshed. If you happen across this little account in your own travels, it is worth the time to read, especially if you are already a Waugh convert.